Recently I went to Illinois to visit family for Thanksgiving. I noticed in the airport there were quite a few bookstores. Most catered to popular best sellers but in some shelves there were public domain books like Great Expectations. I know for certain that a airport would not carry textbooks on call but for those who are in English classes they may want to visit an airport bookstore and compare prices. If you are waiting for the flight to take off then it might be a good idea to see what deals you can find. I don’t know what books I will need for Literary Tradition III but I can say that I have a new outlet for searching for books at least literature wise. I would like to know what uncommon places have people found good book deals whether they were for textbooks or literature books. Anyway that is all for now as I try to recover for tomorrow. Another year, another semester around the corner. I don’t know but I am taking Interterm and looking to see which books are needed for that period of time. I had Interterm a past year and compared what I would have had if I had taken the class as a regular class versus Interterm. It may stink that you are taking a class during a time that should be a break but the one major benefit of Interterm is that there are fewer books to bring to class. If that is not so for you then what standards does your Interterm class have in terms of book load? Do they require the same amount of books as a regular semester or do they cut a few and only reserve the essential textbooks? To the University of Dallas students, one important thing coming up this week is registering for new classes. Once a student sets those up it is time to find out which books are available now and then to compare them later on in the year. Some books may change between now and the next semester but some books remain the same for a class each semester so ask early. 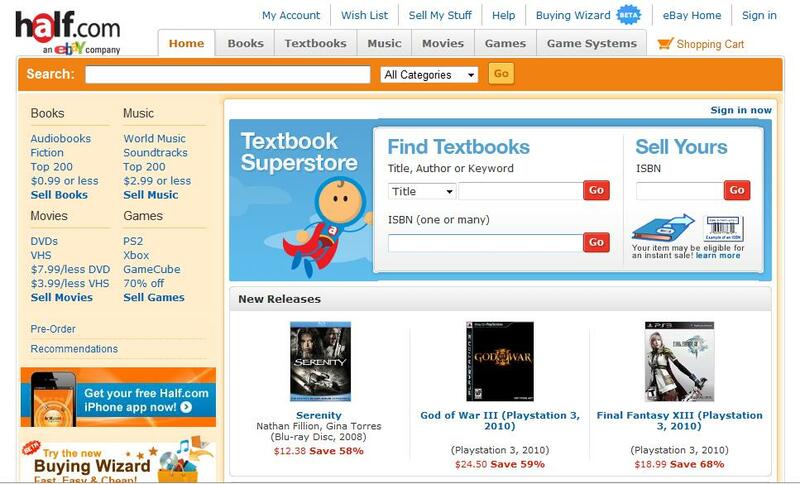 Get easier deals now as more people will try to sell their books back after Midterms or after Finals. Secure a book by looking at your finished schedule and then once a student is sure that those are the classes are the ones they want, get the books that won’t change between now and next semester. Less books to get when the next semester rolls in. As expected I am not the only one blogging about raising textbook prices, and this graph came from a 2008 post made by the Disruptive Library Technology Jester. 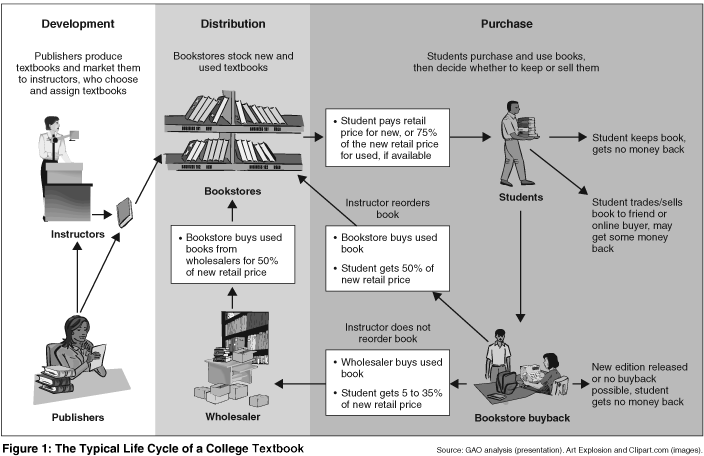 It details the basic structure of how a textbook is bought to the moment when a student tries to sell the book back. The article where the graph came from, “The Complex World of The Textbook,” contained valuable information on the subject of textbooks ranging from ebooks to student’s reactions to the rising textbook prices. The article has updated since it’s first post and is still open for those who want to input their thoughts. The link can be found here. This is going to be a short entry but when you are registering for classes this semester think very carefully about the amount of books you will need for that class. Begin finding out which books are absolutely necessary for the first few weeks and if that decision is not as clear then see which book relates more to the title of the class. One thing is to look at the class description. If the description says they are going to discuss Dante, Homer, and Plato then more than likely a book relating to Dante would be the first to get. Just think things through and do not get discouraged. One major obstacle when choosing between buying a book at the bookstore or ordering the book online is whether or not the book will be in good condition. Especially used books. At least at the University of Dallas, they allow students to sift through a used book before they buy it. That way they can see for sure whether or not the book will last. Online there is no way to check and see. You just have to wait and hope for the best. Also what may seem to the online seller as “like new” may turn out to be different than what you consider. Amazon.com uses a star system with their sellers but they also have sellers promoted by themselves. 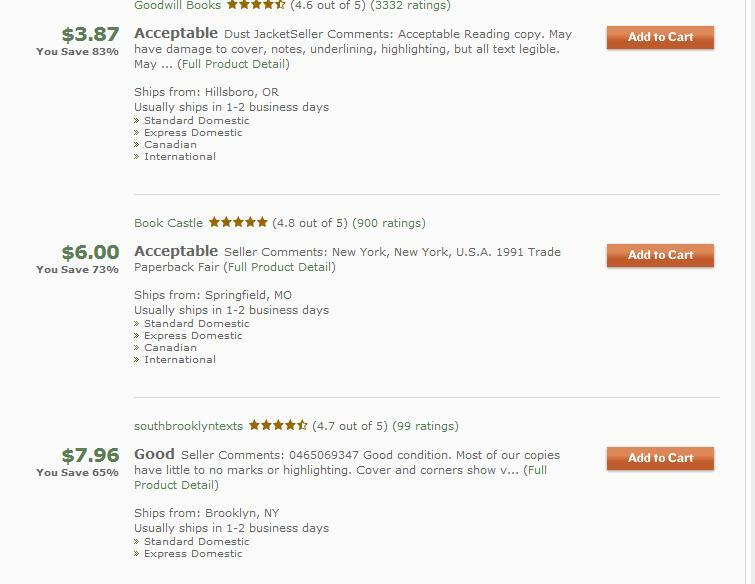 Those are the sellers to buy from because it is more likely to get a used book in good shape though their prices may be higher than other used book sellers. 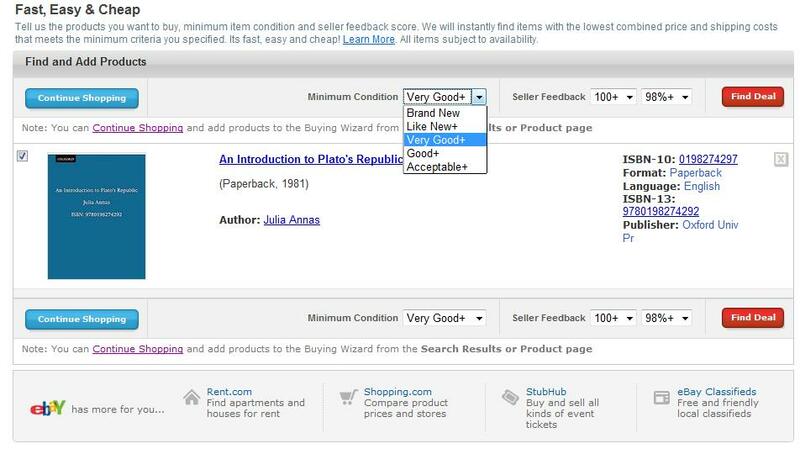 Half.com uses votes but allows people to scroll down and choose what condition of used book they want and choose the star rating of their seller feedback in regard to the used book. If anything, when buying used always make sure the money going into the purchase was spent wisely. I usually don’t hear about this site often but for those who haven’t found the site yet, it is worth a look. The site describes itself as part of an Ebay company and also provides sources for selling videos, DVD’s, CD’s, etc. Once there one can use the search engine and look for books just like other sites. In a way it works like Amazon.com, one can set up an account and sell their stuff through their site. I find this site easier to navigate than Amazon.com but that is just my opinion. Can you recall a book that you read in high school that you had to read again in college? Bity Book Bite: Textbook prices, Why So High? In the article, a professor describes how publishers, through the cost they place on books, basically fund the colleges/universities they send the books to. I was first informed of this by University of Dallas Textbook Manager Matt but I had to look some things up myself to be really sure. I have faced high textbook prices and have been angry at them, particularly anything Biology, Astronomy, Chemistry, that field related because those books tended to be the most costly…and Art. I agree that students suffer the most when it comes to textbooks and the situation doesn’t seem to get any better with the economy being in a slump. Another article from the Fort Worth Star Telegram titled “New federal rules aim to help college students with textbook costs” showcased interviews with students at Texas A&M and their experiences with buying textbooks. I am surprised no one swore. I should note that both of these articles were made in July 2010 a few months before the school year started so it is recent. If universities must have students buy the books from their bookstores to earn funds then hopefully they can find a way to lower the prices. Manager Matt continues to watch over the books and keep observing parents’ and students’ agitated looks. 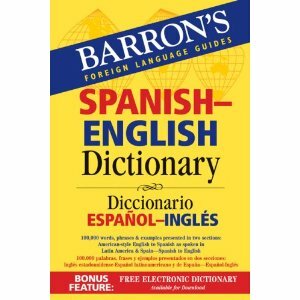 If you have a Spanish class then this book really comes in handy. Along with basic translations, this book contains a list of each word’s tenses, uses in proper speech, and costs on Amazon $11-12. Out of all the Spanish to English translation books, I found this one to be the most useful. See if it works and also if there are more books of this caliber then list them in the comment section.